Literacy has an important position and role in our communities and world. When I think of literacy I think of books and reading. Growing up reading was one of my favorite activities to do, especially reading creative stories. I still enjoy reading even up to this present time. There are many ways in which literature functions in life. Whether it’s in a classroom, library, house, workplace or any other location, it still remains information and knowledge. Below are some highlighted lessons to consider on literacy. 1) Communication and the comprehension of it can be developed through many kinds of reading and different kinds of writing. We communicate in various ways including talking, listening and the way we act. Language is a strong part in how we communicate. What we say, how we listen and what we write all has a part in the process. 2) Writing promotes literacy. Every time a writer writes and shares their writing they encourage others to read, communicate and connect in some form. 3) Literacy is for everyone. Whether a person likes/dislikes to read and write and/or is strong/not strong in reading and writing, we all need it for everyday life and while it doesn’t have to be everyone’s favorite thing to do we can make it interesting in creative ways. 4) Literacy can be in the form of pictures and music. Images and music communicates a message, sound or information when we view and listen closely and thoroughly. 5) Literacy affects every area of living on earth and the quality of life. The attention we give literacy in whatever form can bring the change and increase we need in earthly living. What lessons have you learned through/about literacy? I was walking home from town and as I was enjoying the walk, this lady that saw me grow up came in passing. She asked me, ‘Where are you working now?’ I told her that I’m just doing freelance writing part-time. Every time someone asks me are you working or something close to it, I have that dread feeling of discontent. The lady stopped me in my tracks and poured lots of encouragement and wisdom on me. Little did I know my walk home would lead me on a message concerning the art and beauty within me. This messenger encouraged me to dig deeper with my writing and to explore art more. She built me up with words that there is a lot within me and that I need to not focus on what’s going on around me. As she continued in her words, she told me not to think lowly of myself because I’m not doing the traditional living of where people expect us to be and how we should do things. Once again I was encouraged to create my own establishment of art. Some may not know, but I’ve been interested in and explored various kinds of art. Art such as performing arts, fine arts and writing. Being creative is beautiful! We should never be ashamed of our artistry and we must learn to embrace it. Regardless of our circumstances. 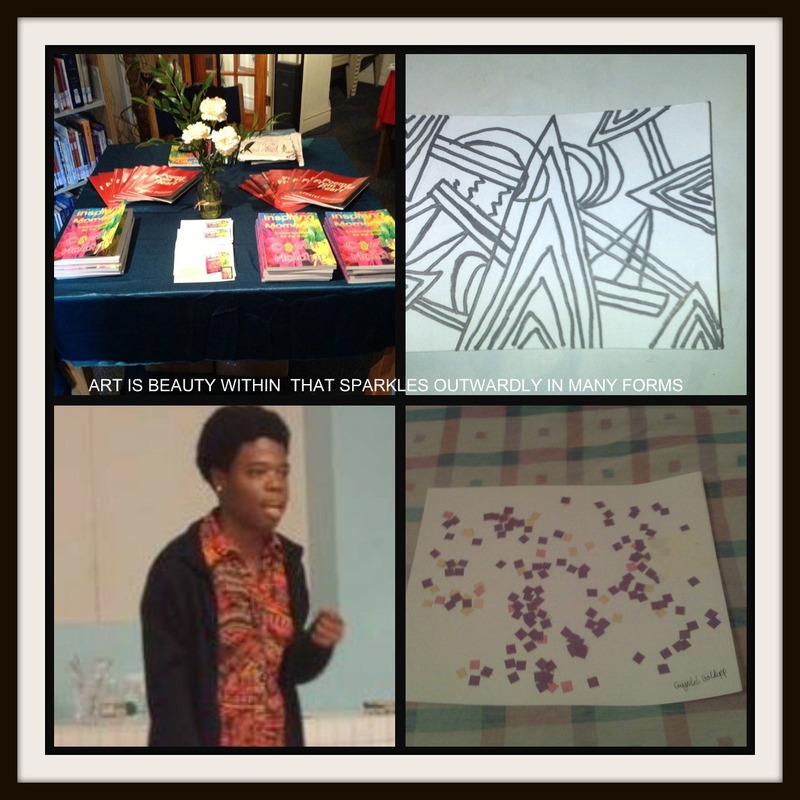 Art is beauty within that sparkles outwardly in many forms. What art do have in you? Are you embracing the artistry within? Sometimes we wait to see what happens or we may have a lack of courage or motivation because of what we think we don’t have. With God we have everything that we could have never imagined. Taking small steps and then bigger ones will lead us on a brighter path. There is no limit to our art! Embrace your artistry!